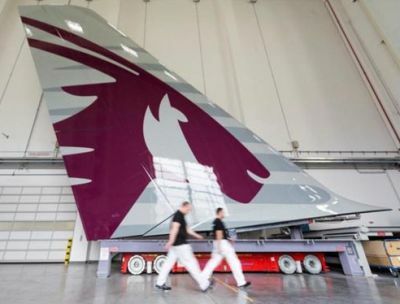 This is the tail plane of the first A380 for Qatar Airways which has been painted with the airline’s trademark oryx logo at Hamburg. It now needs to be flown to Toulouse and fitted to the actual aircraft. Qatar Airways will become the 11th operator of the A380 when it takes delivery of its first aircraft in 2014. The airline has firm orders for 10 A380s and will operate the aircraft on its most prestigious routes.